Of all places, we found him beneath the conference table, eating coffee pods and beta files. If it wasn’t for the smell, I’m not sure we would have ever found him. We’re still recovering some of the lost data. 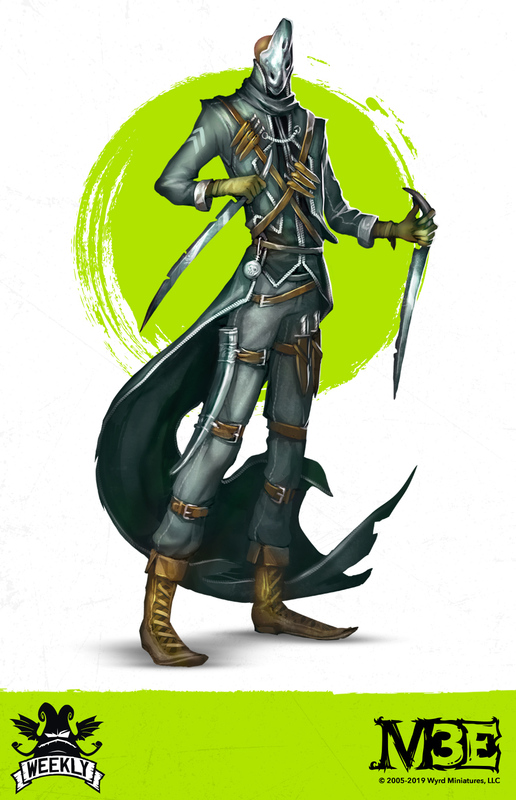 Ironically enough, we did manage to find one of the most well-hidden characters in all of Malifaux, and this week, we’re going to talk about what we found. Lucius’ eyes and ears span across all of Malifaux, but even he has his blind spots, especially on Earth. As soon as he caught wind about forgotten Neverborn meeting in the forests and caves across Europe, he had to know more. But with Marlow taking power after the last Governor-General’s near ascension, the mimic’s grip on climbing the Guild ladder has weakened, so he has requested that his most trusted and unknown agent return to directly aid him once more. Agent 46 is an unnatural menace that strikes from the shadows; both his Stealth and Inhuman Physiology Abilities ensure that he is difficult to see and to hit. When we sat down to think about the types of characters that Lucius surrounds himself with and trusts, the vision became clear relatively quickly. A shadowy figure that no one has seen before because Lucius hadn’t willed it was a more than fitting approach when introducing this new, unseen assassin. Even if his enemies don’t always know where he is, Lucius, always does, which is reflected in Agent 46’s Following Orders Ability. 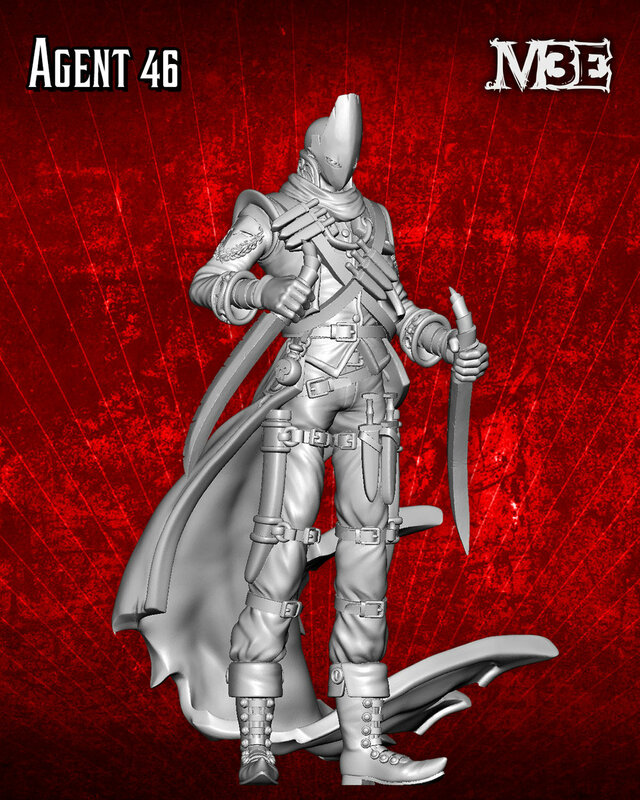 Lucius, similar to Second Edition, is still ordering around his Crew, but he now has a surgical knife in the form of Agent 46 to take care of his… problems. Agent 46’s Following Orders Ability helps emphasize his role in the Elite Crew while simultaneously keeping cards in his hand. This highly mobile assassin has the tools he needs to get the job done. By the time his Twirling Blades are cutting through his target’s flesh, he is likely already attacking another nearby enemy with his Pouncing Strike Trigger. One of the most understated and valuable Actions in Malifaux Third Edition is Analyze Weakness, which Agent 46 utilizes to study his opponent before he strikes, giving him and his allies the opportunity to take down even the tankiest of targets. If he has trouble finding vulnerabilities, he’ll just take a closer look with the On Your Heels Trigger. Agent 46 rarely shows his true colors (or form), but sometimes he just can’t help but Mimic his target, which is exactly what his Bonus Action does. Depending on the situation or opponent, Agent 46 (along with the other Mimics in Lucius’ Crew) brings a ton of flexibility to each game. Next week, Waldo gets in the dirt to dig up an old friend.